HARLINGEN — She was a small-town girl with big dreams, and she followed them, to Okinawa, California, New Orleans, Puerto Rico and beyond. Navy Chief Petty Officer Teresita Garcia, 42, has seen the world. 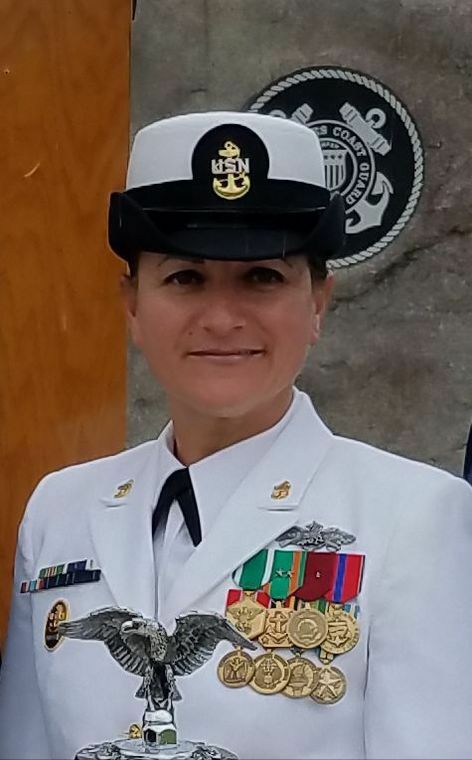 The Roma native, currently the senior enlisted leader at the Navy Operational Support Center in Harlingen, was looking back over her 22 years in the Navy. Those years began when she became frustrated by her yearnings for something more. She’d already earned an associate’s degree in medical records at Texas State Technical College. After working in that field at a hospital in McAllen, she returned to work in Starr County. She was doing well for herself, but she felt a sort of itch for greater challenges. And she went for it. At age 23, Garcia joined the Navy. Her decision was met with mixed reactions. He had recently returned from serving in Desert Storm and didn’t feel the military was any place for a woman — but she knew there was a place for her and she was right. The Navy had an endless variety of new experiences waiting for her, starting off with boot camp in Orlando, Florida. Her first impression of the Navy? “Scary, because not being military oriented and stuff like that, the whole military language, I was kind of like, ‘What did I get myself into,’” she said with a laugh. After boot camp she was sent to San Diego to train as a mess management specialist. In layman’s terms, she went to cook school. “I was an E-3 when I entered the Navy because I had a little bit of college,” she said. After finishing cooking school she was sent to the USS Dixon in San Diego. Once she adjusted to her new life in the military and understood the procedures better, she began to enjoy the experience. She also appreciated the camaraderie with her fellow sailors. “Once you’re on the ship out on the water you can only rely on the people that are going to be with you,” she said. As part of the decommissioning process, the ship had to sail from San Diego south to the Panama Canal and up the East Coast to Norfolk, Virginia. The voyage included the famous “shellback initiation” for her and other sailors crossing the equator for the first time. Because the ship was headed for decommissioning, there was no leaving the ship to visit Panama City or any other location. They passed through the locks and headed straight up the coast to Norfolk. Her next duty station took her to a U.S. Naval Construction Battalion in California. Other duty stations included New Orleans and Ft. Worth. When she had her first child, son Ulises Aldaco, she left active duty and joined the Reserves. She couldn’t stay away from active duty for very long, however. A few months later she went back on active duty and was assigned to New Orleans where she did some hands-on Cajun cooking. She spent three years there before transferring to Ft. Worth. Her New Orleans connection proved crucial soon after when Hurricane Katrina slammed the coast city and sent refugees to locations across the country, including Ft. Worth. With the rank of E-7, her duties took on an entirely different role. “Once you become an E7, which is a chief petty officer, you’re a jack of all trades,” she said.